//inject angular file upload directives and services. If you observe above code in header section we added “ng-file-upload-shim.min.js” and “ng-file-upload.min.js” file reference you can get those two files from this link angularjs file upload module or you can download from attached folder. 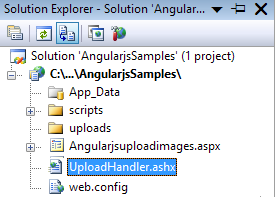 Here we added these references to upload files to folder and we can implement validation for file upload control and add restriction to allow only 2MB files to upload by using angularjs file upload module. I love you man! God bless you. good evening sir pls it isnt working for me..